UFC 205 wasn’t merely about Eddie Alvarez defending his lightweight belt against featherweight champion Conor McGregor, it was about whether McGregor would make history and fulfill his prediction of becoming the first UFC champ to ever hold two different belts simultaneously. McGregor’s fellow Irishmen came out in droves to pack NYC’s famed Madison Square Garden to the rafters, smashing the historic arena’s live gate record with $17.7 million. McGregor was late, per usual, so Alvarez left the podium until “Notorious” graced everyone with his presence. When McGregor arrived, in a white fur coat outfit inspired by Joe Frazier, he took the belt that was sitting in front of Alvarez’s name card and put it in front of his seat. Alvarez immediately returned to the stage and snatched his belt back, which nearly started a riot. UFC welterweight champion Tyron Woodley and McGregor have an awkward and tense exchange backstage, which Woodley seemed to smooth over with a friendly “Conor, what’s up?” Then they engaged in a Twitter war. McGregor and Woodley pick up right where they left off on Twitter and had to be separated backstage. McGregor then turned his attention to lightweight contender Khabib Nurmagomedov, which required countless security to keep the bitter rivals apart. In a game of MMA Jeopardy: Who is Liz Carmouche? She is the first female in UFC history to fight for a title and step foot inside the octagon inside Madison Square Garden. Despite missing weight by a whopping 6.6 ponds for his lightweight debut, which forced his bout with Jim Miller to be changed to a 163-pound catchweight contest, and enjoying a significant size advantage over Miller in the cage, Miller grinded out a lopsided unanimous decision victory over Thiago Alves. Miller also scored 20 percent of Alves’ show money for missing weight. Nurmagomedov got rocked early, but went on to dominate Michael Johnson for a kimura finish. He proceeded to call out McGregor after the fight. As customary with all Frankie Edgar fights, his battle with Jeremey Stephens was a war. Edgar took a decision. Raquel Pennington trounced former featherweight champ Miesha Tate. Tate decided to call it a career after admitting she just doesn’t have it anymore. Yoel Romero provided the most vicious highlight reel finish of the night with a perfectly timed flying knee to the dome of former middleweight champ Chris Weidman. Romero then got into an exchange with current middleweight champ Michael Bisping during his in-cage interview, who was shown on the big screen while serving as an analyst for Fox Sports 1. Bisping flipped him the double bird. Joanna Jedrzejczyk retained her strawweight belt in relatively easy fashion against Karolina Kowalkiewicz. The Bruce Buffer (or New York State Athletic Commission) blunder. After being handed the score cards after an epic battle, Buffer was called back outside the cage and given another score card to read. The three judges rendered a majority draw (47-47, 47-47, 48-47) between welterweight title holder Woodley and Stephen Thompson. However, Buffer initially read the same scores but said Woodley won via split decision. Buffer was then asked to get back on the mic to tell MSG and an upset Woodley that their shootout was actually a majority draw. Woodley was completely confused and thought he didn’t retain his title. After realizing that he still gets to keep his belt, Woodley was visibly disappointed that he was leaving the cage with a draw instead of a win. McGregor floored Alvarez three times in the opening round with his trademark left hand. Alvarez, who most thought would try to wrestle McGregor, was ultimately put to rest in the second. 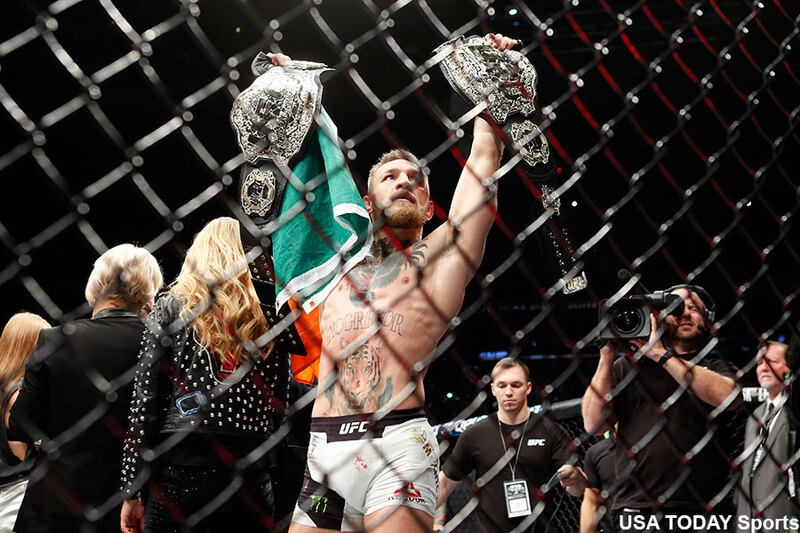 McGregor makes history by becoming the UFC’s first two-way champion. McGregor was upset with UFC president Dana White for not having two belts on hand for him to hoist inside the cage. White had to scramble, sending someone backstage to barrow Woodley’s belt to lend to McGregor. Woodley was not pleased. McGregor then gets on the mic and says, “I would like to take this opportunity to apologize to … ABSOLUTELY NOBODY!” That line will go down in MMA lore. McGregor’s big announcement is that he and his longtime girlfriend are expecting their first baby. McGregor demands part ownership of the UFC before he takes his next fight. Alvarez admits he was suckered into fighting McGregor’s fight. White said UFC 205 set a new company pay-per-view record. White said an instant rematch between Woodley and Thompson is on deck, and Bisping vs. Romero was likely.